Then there was Crespin’s, the simplest and one of the best restaurants in the world… in the winters an old oysterman stood outside always by his fish, stamping his feet like a horse and blowing on his huge bloody mottled hands. 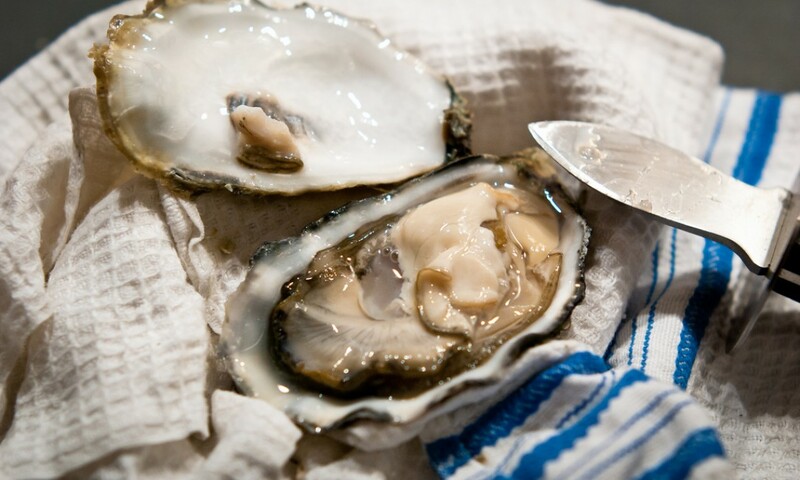 He had baskets of dark brown woven twigs, with the oysters lying impotently on seaweed within… Portugaises, Marennes, Vertes of different qualities, so fresh that their delicate flanges drew back at your breath upon them. Inside the little restaurant you could eat them with lemon and brown buttered bread, as in Paris, or with a plain crust of the white bread of Dijon. Then there were snails, the best in the world, green and splitting in their little delicate coffins, each in its own hollow on the metal plates. After you pulled out the snail and blew upon it cautiously and ate it, you tipped up the shell for every drop inside and then with bread you polished the hollow it had lain in, not to miss any of the herby butter. Crespin’s always had tripes a la mode de Caen, too, in little casseroles, and salad and a piece or two of cheese. And that was all… another proof of my firm belief that if a restaurant will be honest about a few things, it can outlive any rival with a long pretentious menu.